Polarized Projection Only. Designed for both passive and active 3D systems as well able to shine in a well lit area. This coating delivers high gain superior clarity with 4K ready smooth coating technology. High extinction and non depolarizing. The pinnacle of our flagship lineup with the meeting of Diamond and Silver. This is an elite product. Electronic verified, handmade, limited availability. Diamond Silver is reserved for the elite customer with an eye for perfect. Superior color, contrast and clarity. Brilliant white highlights beautiful imagery. Again, part of our flagship lineup Diamond projection screen is an architectural dream piece. Blend elegantly into bright environments or command the center of attention with its crystal radiance and eye popping brightness. Paint On Screen is the leading single-coat projection screen paint that allows anyone to paint a screen onto any surface. Our technology makes creating a projection screen extremely cost effective. In less than an hour you can paint vivid 2D or brilliant silver 3D screen with picture perfect 1080p HD and even 4K UltraHD clarity. Living Room Wall to Home Theater! Bigger is Better! Paint On Screen makes it easy to transform any wall, ceiling, floor, dome, window, building or other surface into a beautiful and extremely effective HD projection screen. Often times our customers will paint the entire wall or just the screen size with a painted border or frame. Creating Unique Commercial Solutions for Clients. 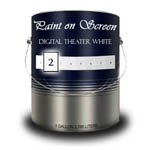 Paint On Screen provides solutions for the entire large media sector. Cost savings are easily seen by operations such as schools, churches, convention centers, conference rooms, hotels, restaurants and sports bars, arenas, large venues, stage productions and more. Paint On Screen has superior contrast and visual depth compared to vinyl or material screens. 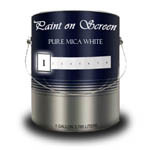 Paint On Screen is a patent pending formulation of compounds developed through extensive research. Paint On Screen provides flat spectral response eliminating image color shift. Paint On Screen is formulated on an absolute neutral gray scale. Paint On Screen eliminates 4:3, 16:9, 1.78:1, 1.85:1 and 2.35:1 masking problems. Paint On Screen can clearly represent pixel resolution up to 4K Ultra HD in under 80" diagonal. Paint On Screen costs hundreds less than any other solution. Paint On Screen is very easy to apply. One application with no special mixing or tools. Paint On Screen uses a specialized and highly refined silver metallic base to ensure pixel clarity, sharpness and uniform brightness. Our silver is known for being the most contrast-boosting and color-enhancing material of any screen type. With a projection screen paint you no longer have to worry about image bleeding, aspect changes from TV to DVD or expensive masking systems. You are now free to design / build without traditional screen size restrictions. Apply two (2) Light Coats. Let dry between each coat. You can choose to use any type border you want. A flat black or stained trim of any style can be used for a more classic look while some opt not to use any border for a invisible modern look. Digital theatre paint can be used on vaulted ceilings, family rooms with hidden electronics, media rooms, 3D gaming rooms, simulators, Anywhere! A quick numbered description helps you choose the color that is right for your application. Translucent along with slightly radiating properties allows Paint On Screen the ability to add depth and contrast to any smooth surface. 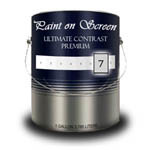 Paint On Screen comes in several shades, container sizes and both for internal and external use. Level 5 Shade (S1 Silver) 1.5 Gain, Absolute Neutral Color Shift, Supports up to 4k HD Resolution. 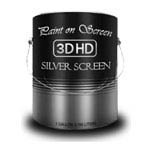 Digital Screen Paint - Silver is the #1 among Home Theater Enthusiasts. At a Reference Level, no other product is demanded more. Level 7 Shade (S1 Ultimate Contrast) 2.0 Gain, Neutral Color Shift, Supports up to 4K HD Resolution, designed for High End entertainment environments with High Ambient Light. Polarized 3D, High Gain, Micro Projection Applications 4.0+ Gain, 3D 4K Ultra HD Compatible, Low Ratio of Extinction, Very High Polarization Retention, 110 degree viewing angle. 2D and 3D applications **This Formula Must Be Sprayed. ** Please review Specification guide. This is a version of our popular Digital Screen Paint - Silver designed specifically for outdoor use. Like its indoor equivalent, it has a greater level of contrast, a modest level of gain and a Level 5 Shade. Order a complete Teflon coated Micro Fiber roller kit complete with 1 x paint tray, 1 x roller handle and 2 x Teflon coated Micro Fiber roller brushes. Ensure even screen paint distribution and esy clean up. Paint your screen as soon as it arrives!